With sadness, I predict we will live to regret this day, Oct. 10, 2002, the day we stood by and we allowed these terrorist organizations to continue growing in the shadows. This timid resolution, I fear, will only increase the chance of Americans being killed, and that is not a burden of probability that I am prepared to take. Therefore I will vote no. Yeah, Cheney’s misattribution probably wasn’t a typo, but instead a cynical attempt to pretend that the Democrat who had reviewed the intelligence behind the war most closely had backed the war, rather than correctly predicted it would heighten the threat of terrorism. But I don’t think the grammatical error in the following passage, describing the relationship between Cheney’s illegal wiretap program and the PATRIOT Act (which turns 10 today), is really a typo either. One of the first efforts we undertook after 9/11 to strengthen the country’s defenses was securing passage of the Patriot Act, which the president signed into law on October 2001. A minor point, but one that might suggest Cheney once had the date in there and then took it out. I also thought it important to be sure the National Security Agency, or NSA, which is responsible for collecting intelligence about the communications of America’s adversaries, was doing everything possible to track the conversations of terrorists, so I asked George Tenet whether the NSA had all the authorities it needed. Tenet said he would check with General Mike Hayden, who was then director, and a short time later both of them came to see me in my office in the White House. Hayden explained that he had already made adjustments in the way NSA was collecting intelligence. Those adjustments were possible within NSA’s existing authorities, but additional authorities were needed in order to improve the coverage and effectiveness of the program. A few paragraphs later, he continued. With [Bush’s] approval, I asked Dave Addington to work with General Hayden and the president’s counsel, Alberto Gonzales, to develop a legal process by which we could ensure the NSA got the authorizations Hayden needed. It’s only five paragraphs after Cheney’s description of PATRIOT that he provides the date that–had he actually included the date of the PATRIOT Act–would have made clear that the illegal program started before the signing of the PATRIOT Act. On October 4, 2001, the president, on the recommendation of the director of central intelligence and the secretary of defense, which the determination of the attorney general that it was lawful to do so, authorized the program for the first time. Of course, Cheney leaves out some key details along the way, such as that Hayden briefed the House Intelligence Committee about what he was already doing on October 1, which elicited some questions from Nancy Pelosi, then the Ranking Member on HPSCI. Cheney doesn’t mention that Bush clamped down on briefing Congress on October 5. And he doesn’t mention that Pelosi raised questions about minimization, in writing, on October 11, but never got answers to those questions. Cheney also doesn’t mention that David Kris, who was busy drafting the PATRIOT Act, got an OLC opinion on September 25 approving the one change to FISA he deemed necessary to make with the PATRIOT. To reveal those details–the briefings to Congress, Pelosi’s questions, Kris’ ability to get FISA changed under PATRIOT–would have made it clear that the rest of the “legal approval” process Cheney describes could have–should have–instead been done with Congress as part of the PATRIOT Act. I may be nitpicking here, writing an absurdly long post about Cheney’s use of the wrong preposition. But Cheney’s choice to bypass Congress even as it was making changes to FISA remains the biggest piece of evidence that he knew he was engaging in an illegal program that Congress would not entirely approve. There will be a number of retrospectives in “honor” of PATRIOT Act’s birthday today. 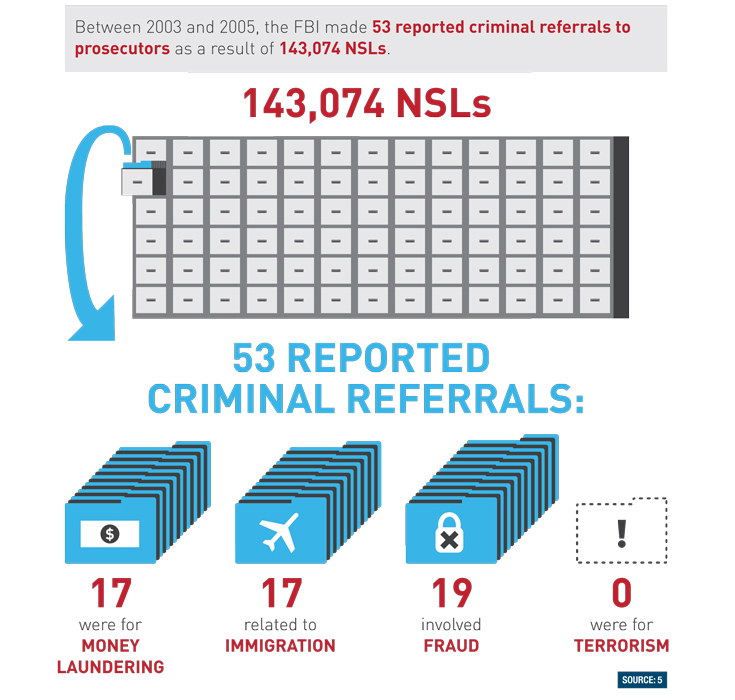 ACLU’s got a nifty infographic (the image above is just one part of it). But ACLU’s other “tribute” to the PATRIOT–a lawsuit to force the government to reveal its secret interpretation of PATRIOT Act–and Cheney’s typographical tell that he recognizes he deliberately chose not to get Congressional approval for the illegal wiretap program are even more important. As horrible as the PATRIOT Act is, after all, both the Bush Administration and the Obama Administration have exceeded the plain meaning of the act. 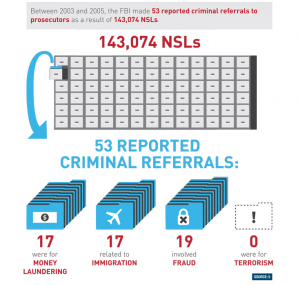 For ten years, then, it has not been enough that Congress has eagerly dealt away our civil liberties. But the Executive Branch will take even what Congress won’t give. https://www.emptywheel.net/wp-content/uploads/2016/07/Logo-Web.png 0 0 emptywheel https://www.emptywheel.net/wp-content/uploads/2016/07/Logo-Web.png emptywheel2011-10-26 13:19:402011-10-26 13:35:27"The Patriot Act, which the president signed into law on October 2001"
And I don’t know why he’s weaseling. He’s gotten away with it. And he’s changed America forever. I’d think he’d be gloating. Hell, even if the 2016 president were to permit him to be charged with murder, he’d likely get a medical pass. And he’ll likely be gone before 2016, anyway. Agreed. But I suspect we’re talking technicalities. If this cretinous stuff were put to a vote in Congress — the “People’s House,” as they say — I’d be shocked if more than a handful of members would rise up against it. In this, Cheney read the public accurately (assuming, of course, that he bothered to care in the first place). One of the things that keeps any of this stuff from getting corrected is the damned AUMF. As long as the AUMF is in force, Congress won’t do anything of significance to restore civil liberties, and the Courts will continue to be deferential to the Executive Branch. Dean’s “cancer on the presidency” phrase is here applicable to the Constitution itself: The AUMF is a cancer on the Constitution. I’m wondering if it would be worth electing someone like Ron Paul as president, if it meant that this cancer could be removed. It used to be that Republicans were extremists in opposition to keeping the Feds out of the bedroom, my home is my castle, and all that kind of rhetoric. No more; Republicans and Democrats alike now join together in a bi-partisan dismembering of the Constitution, each apparently eager to out-do the other. This is the kind of glide path that put Hitler in power. Put this together with your post earlier today on the timing of the Anthrax letters. It’s the kind of thing that leads me to think that Cheney engineered the Anthrax letters in order to get something like the Patriot Act enacted in order to provide cover for the “authorities” he wanted to snoop around. We’re lucky that Cheney’s excesses began to offend even Bush’s people during Bush’s second term, reigning him in but not relaxing their new authorities. @Bob Schacht: That would, um, be manslaughter or reckless homicide. But what’s a few Americans, including a few of those he hated on Capitol Hill, when Mr. Cheney was willing to put the lives of millions of Iraqis at risk in order “not” to go to war for oil and to exchange a no longer useful despot’s regime for one that might be useful.